From war-ridden cathedrals to myth-enshrouded statues and mysterious mummies, Bremen has plenty to explore. We take a look at the highlights the Hanseatic city in Germany’s north has to offer and compiled a list of the top 10 things to do when you’re in town. For more than 1,200 years a church has overlooked Bremen’s main market square, though today’s cathedral is the outcome of a turbulent and war-haunted history. 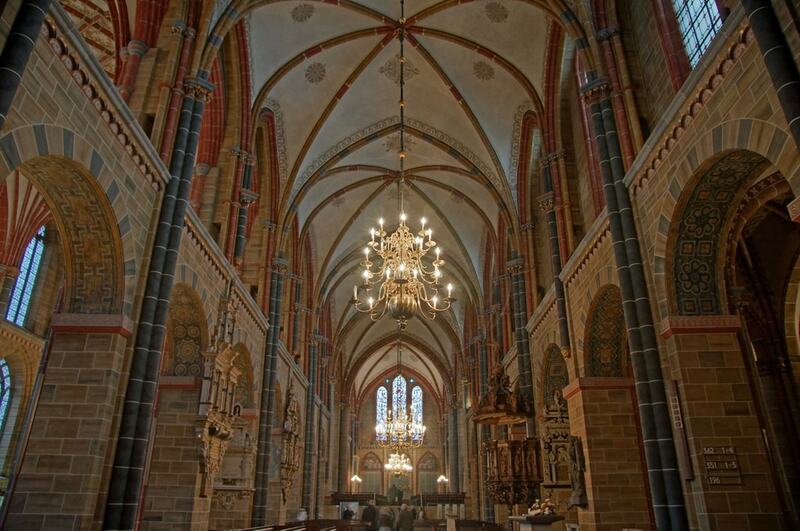 The 789 wooden cathedral was soon replaced by a stone structure, but was destroyed several times until an 11th century reconstruction formed the foundation for today’s cathedral. But again, wars ravaged Bremen; the cathedral was reconstructed by 1901, only to be hit by Allied bomb raids in the Second World War again. Costly reconstruction works were not completed until 1985. Guided tours offer a more in-depth account of the impressive building, and the platform at the top of the southern tower has the best views over Bremen’s city centre. A lot of Bremen’s sights centre around the main market square and the City Hall is no exception. The magnificent building ranks among the most beautiful city halls in all of Europe and earned UNESCO World Heritage status back in 2005. Originally built in the Gothic style, the City Hall was adorned with filigree Renaissance details some 200 years later. There’s plenty to see inside as well, including Germany’s oldest wine cask. 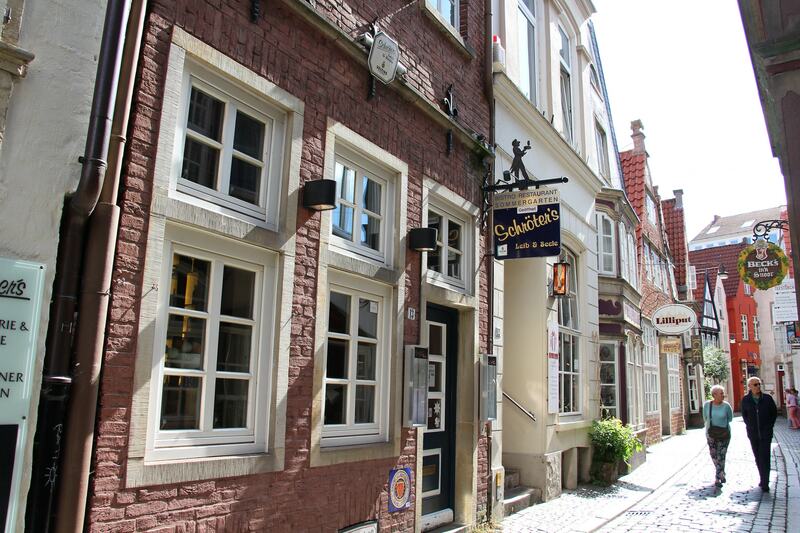 Bremen is steeped in several sagas and legends. In 1819, the Brothers Grimm published a story of an unlikely group of friends. After having served their masters for a majority of their lives, a donkey, a dog, a cat, and a rooster decide to call it quits and set out on an adventure on the quest for freedom. Their goal: travel to Bremen and become musicians there. 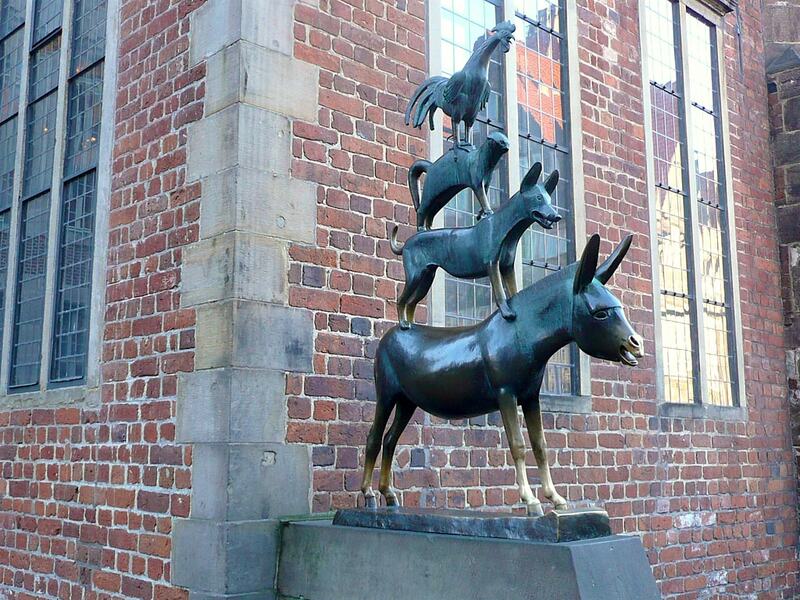 The folktale of the Town Musicians of Bremen is immortalised by a Gerhard Marcks bronze statue which was erected next to the town hall. The Schlachte Embankment is Bremen’s most popular strolling promenade. Restaurants, bars and beer gardens edge the Weser riverfront and leave you spoilt for choice when you’re looking for a place to unwind on a sunny afternoon. Anchoring boats offer cruises down a stream, and Saturdays see stalls pop up for the weekly antiques and flea market. If you’re here in December, you might find yourself spellbound by the festive atmosphere the Schlachte-Zauber Christmas market brings along. The medieval and maritime-themed festival is all about traditional foods, Glühwein and handcrafted goods. 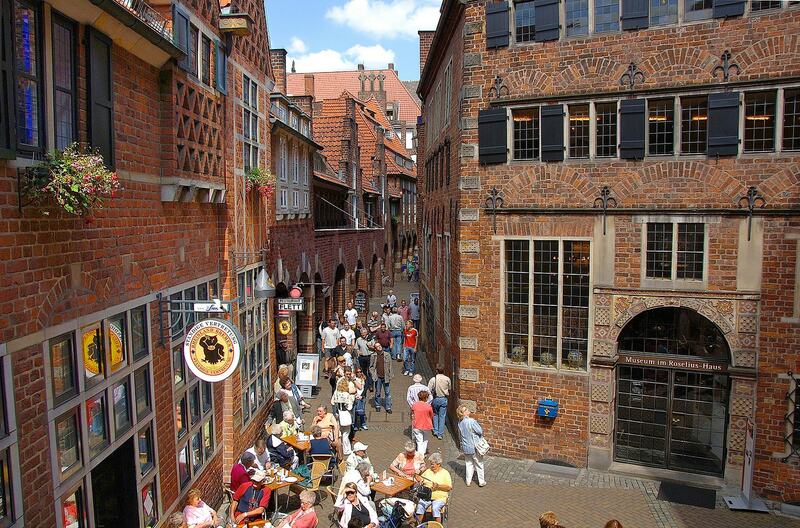 Bremen’s oldest quarter is a labyrinth of narrow winding alleys, lined by half-timbered houses from the 15th and 16th centuries. A colourful mix of boutiques, artist workshops, goldsmiths, and international restaurants populate the pedestrianised streets and create the ideal setup for an afternoon’s worth of shopping for authentic handicrafts that have a long tradition in Bremen. The Kunsthalle art gallery is home to a collection of European paintings, drawings, and statues from the past 600 years. Notable works of the 19th and 20th century by the likes of Monet, Manet, Cézanne, and Liebermann are the highlights, though the 220,000 items displayed at the Department of Prints and Drawings are impressive, to say the least, and form the most significant repository of its kind in Europe. This charming lane forks off the market square, its name derives from the time when the coopers (Böttcher) lived and worked here. The houses started to decay until the coffee merchant Ludwig Roselius bought them all and rebuilt them from scratch. He created a homogenous streetscape of Art Deco and red brick buildings that today house craft shops, boutiques, museums, and artist studios. If you look up, you’ll spot a carillon of 30 Meissen porcelain bells that play folkloric songs. Beer has been an intricate part of Bremen’s culture since the 11th century, and the long-standing tradition has spruced one of Germany’s most loved beers – Beck’s. An estimated 3,000 bottles are being opened every minute across the world. A guided tour takes you into the brewhouse and around storage rooms, malt silos and fermentation tanks and offers a few samples at the end of it. Though Beck’s provides a great experience, craft beer fans might want to consider venturing out to Bremen-Osterfeuerberg to peek behind the scenes of the Union Brewery. 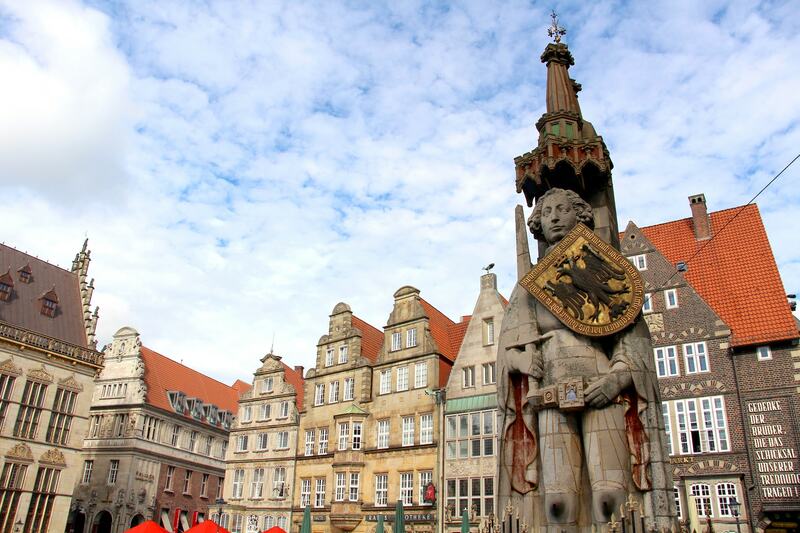 Armed with a sword and shield, the 1404 statue of Knight Roland stands towering over Bremen’s medieval market square. Even though statues of the medieval knight are scattered across Germany, Bremen’s Roland is believed to be the oldest and most representative of its kind. The proud depiction of the warrior symbolically protects Bremen’s civil rights and independence, and has done so since the time of the Roman Empire. Both the plaza and the statue were listed as UNESCO World Heritage Sites in 2004. Below the ground in the vaults of the Bremen Cathedral lie several mummies that were only discovered by chance in 1698. The sensational find led to all kinds of theories as to how and why the eight bodies were mummified, but scientists today agree that the dry air in the crypt preserved the bodies naturally. The sight of the mummified bodies stored in open coffins is more than creepy yet somewhat fascinating.